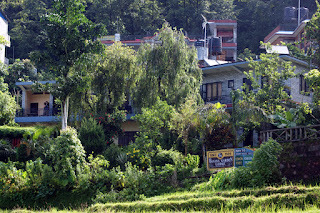 Banana Garden Lodge - "One of the best and brightest budget guest house in Pokhara, Nepal"
Started in early 90's, the Old and Popular, Banana Garden Lodge, we have been giving the best with our services to our guests, visitors and friends, we have since meet and made. Located at northern Lakeside, Khahare, in the Pokhara, the only greatest seneric city in Nepal. 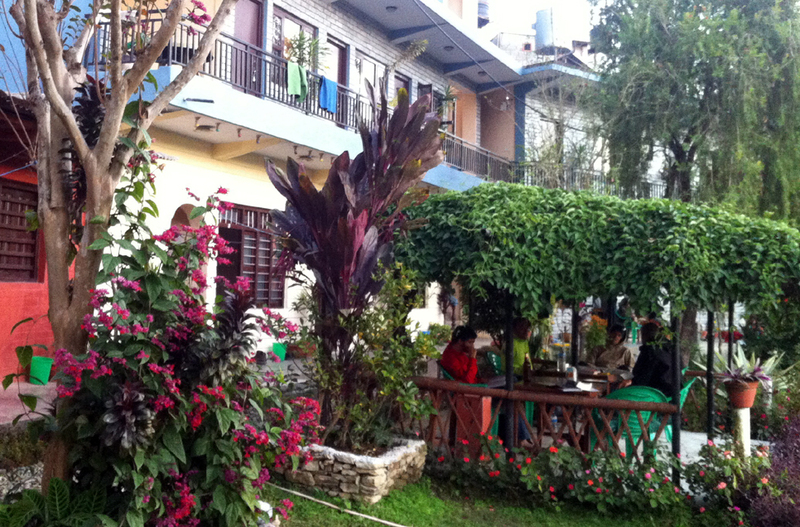 Just a few minutes walk from the busy lakeside in Pokhara and away from the busy center, it is popular for the tranquility and peace. These features inherits a great charm during the stay. One of the other most Specular feature is the resting place... places to lay down hammock, or the read over a sitting places, gives a home alike environment during the stay. During your stay you can have great time with various activities like to organize and fix short trek, walk or visits to different places. 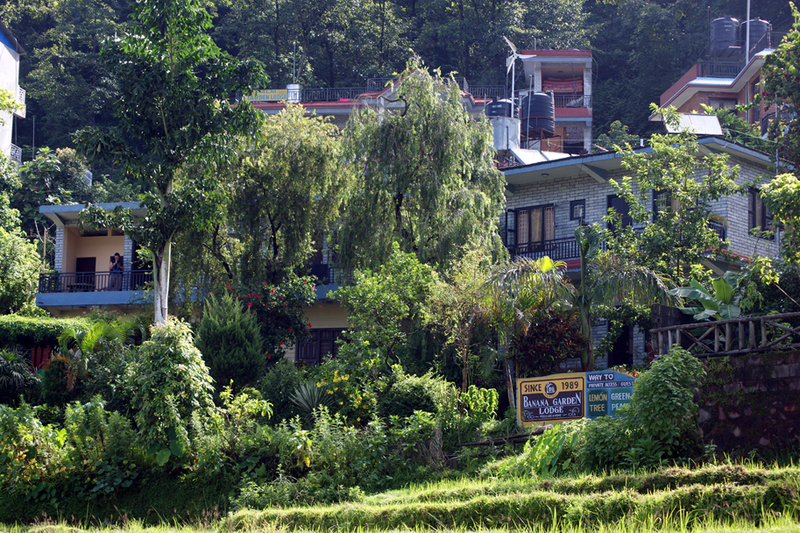 Sarangkot is well known for a day trek, you could just start of the walk from the place and in about 20 minutes you are at the bottom of the Sarangkot from where you can climb as smost of the path has got stairs. When you reach the top you might feel dignified as it provides the best views of the mountain ranges in the north and the over all view of the Fewa lake, along with the Harpan river that trails from the south west of the mountains and merges into the lake. Stupa is also something of an interest, as it is one of the greatest symbol for peace. You can make about an hour boat trip over the lake and then 40 minutes walk to this Stupa.Also, different museums, caves, ancient and religious temples are located around or within the city. We have always been stable and rigid with our position, its business and its services through every circumstance, since it started. 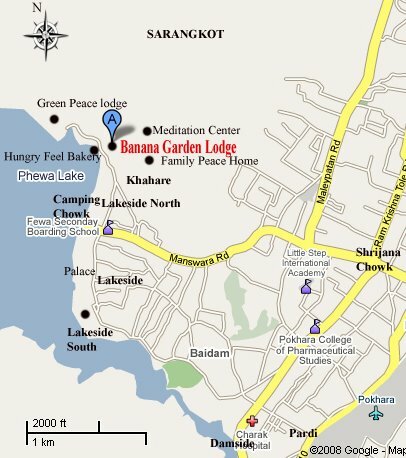 We thank to all the friends, visitors and the great authors of the popular travel guide books for their genuine recommendations which has always greatly felicitated....and will always do for the image and the position of the little home- "Banana Garden".